The 20 EUR nightly credit rate is based on the best flexible rate for the night. There are lower advance purchase rates. In essence, you are paying for the 20 EUR credit. This rate offer may work for locations that don’t have other discounted rates available for the dates in question and if you need flexibility. This rate plan is cancelable until 6PM on the day of arrival. 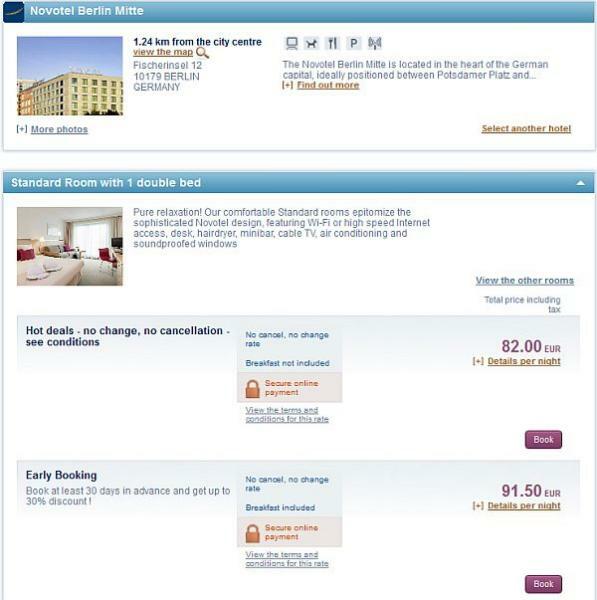 “Hotels extra offers” is available at participating Accor hotels in Europe (all brands) for bookings from 28th January 2013 until17th February (except for the UK 4th February – 17th February) 2013 and for stays between 22nd February – 22nd March (for hotels in France), from 1st – 31st March 2013 (for hotels in Italy, Spain & Portugal), 1st March – 7th April (for hotels in Germany, Austria, Switzerland, Poland, Sweden & Hungary), from 1st March – 15th April 2013 (for hotels in Benelux), from 1st March – 14th April (for hotels in the UK). Rooms that are part of the special offer are subject to availability at time of booking. The offer can be amended or canceled until 6pm (hotel local time) on the day of arrival. A valid credit card is necessary to guarantee the reservation at time of booking. After that time, 1 night will be charged. A discount will be awarded daily to the client per room and per night in the local currency of the applicable hotel, whatever the number of persons occupying the same room. The daily allowance varies based on hotel brands: Sofitel €40 (EUR), Pullman €40 (EUR), MGallery €40 (EUR), Mercure €20 (EUR), Novotel & Suite Novotel €20 (EUR), Ibis & Ibis Styles €15 (EUR), ibis budget & hotelF1 hotels €5 (EUR), except ibis budget in France €10 (EUR). The daily discount is valid for use during the stay in the hotel between check-in and check-out time by the person that booked the accommodation and is eligible for use towards Bar, Restaurant, Room Service, Room Upgrade, Movies, Wi-fi expenses, subject to availability at the hotel. For Ibis & Ibis Styles the use of the daily discount is against room rate OR expenses listed above. For Ibis budget and hotelF1, the amount of the daily discount is already deducted from the rates eligible to this offer, as defined here above, at the time of booking online (valid only for bookings made at www.hotelf1.com, www.ibisbudget.com, www.ibis.com and www.accorhotels.com). Foreign currency conversions are given as guidance only and are non-binding. Only the currency confirmed at time of booking is guaranteed. The daily discounts can be accumulated and applied to the whole stay, on the total price including VAT. Expenses incurred in the hotel over and above the total accumulated discounts however, will need to be paid on check-out. Please note that for Suite Novotel hotels, the payment of the offer must be paid at check in. Not eligible for use towards accommodation (except for Ibis-Ibis Styles, Ibis budget and hotelF1) or gratuities, and cannot be exchanged into cash if not used totally. Not eligible for use towards conferences and events services. This offer may not be used in conjunction with other offers.